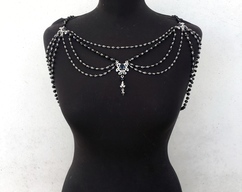 Very tender and romantic shoulder necklace with natural nacre beads and tassels. Tassels playfully rustling during movement. It is perfect solution for plain dress, open shoulders, and it’s a great duet with swimsuit. Necklace has a clasp on the neck.